When you spend more than an hour glued to social media, you need to take a break. That was me for most of last year, so I turned off all notifications and went into hibernation mode where the social network was concerned. 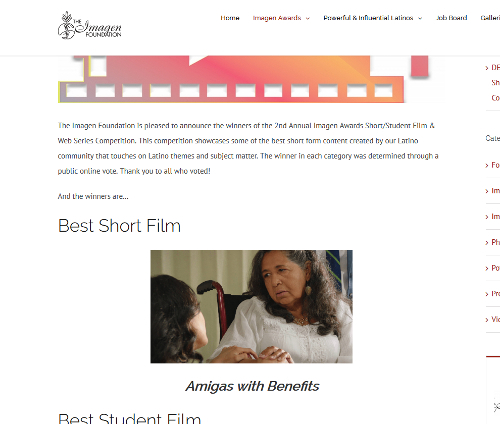 "Amigas with Benefits" won the award for Best Short Film in the prestigious Imagen Foundation's 2nd Annual Imagen Awards for Short/Student Films and Web Series! Congrats to the entire cast and crew, but more importantly, many many MANY THANKS to all the people who voted for us! "Amigas with Benefits" continues to make the rounds in the film festival circuit, so keep an eye out for it at a film festival near you (you can follow on Facebook for more up-to-date information)! Copyright © Jean Kim. All rights reserved. Title art by Maria Perez.